One small detail…and the photo is unusable. I didn’t notice that during the shoot. This is why I try to use trained models who can keep track of such details. This entry was posted in pistol and tagged 9x19, model, photography. Bookmark the permalink. Um… low hold? That seems a bit nit-picky, it’s still a wonderful photo. Its an HK, it will shoot no matter what! VP9, I shot one of those today, nice gun. Didn’t think it was that big of a deal but I guess if the point of the shot was the image of actually pulling the trigger then ya, low hold is not good. At least her thumb isn’t behind the slide. Maybe it’ll be your biggest mistake for the month. I was going to say; a low hold is minor compared to thumb behind the slide. If you can get her to place the trigger in the middle of her index finger pad instead of the joint inflex; that would be great also. Since we are nitpicking.. I suggest that most people who see the photo (well, men, anyway) will be too busy looking at the model to spend a lot of time critiquing her technique! Still, I understand your frustration: you’re a pro and like things to be just so, and are understandably cross when they aren’t. 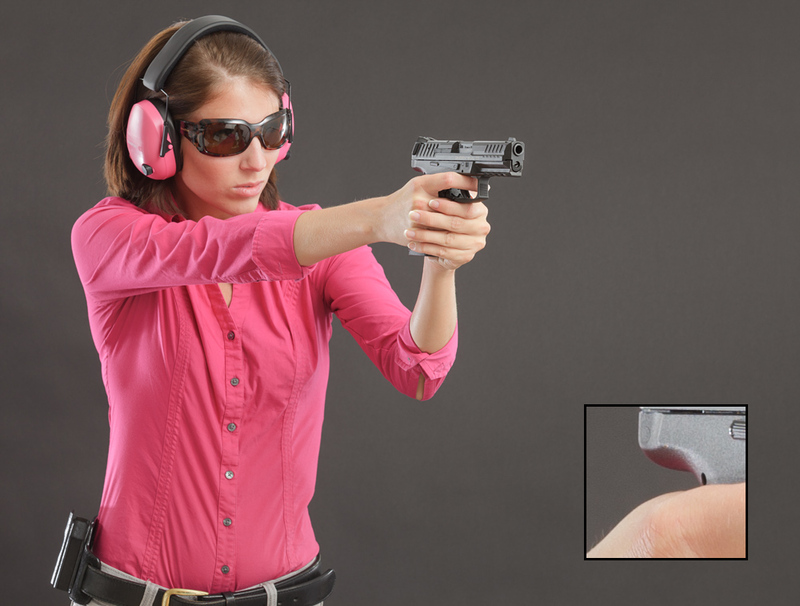 She also has her finger inside the trigger guard and on the trigger. Isn’t that a second problem for you? Since she is about to fire, I’d think a finger on the trigger would be required.